The UN's cultural agency yesterday warned the international art market to be on the alert for Libyan antiquities looted during unrest with the fall of the Gaddafi regime. Libya has five World Heritage Sites including ruins of Roman cities and cave paintings going back 14,000 years. There was no immediate suggestion that sites had been raided, though there have been sporadic reports of looting in the capital, Tripoli. Fighters, who took over the dictator's compound at Bab al-Aziziya, escaped with souvenirs and valuables hoarded by the family and its cronies. The director general of Unesco, Irina Bokova, said that Libya was of great importance "to humanity as a whole" and contacted authorities in Tripoli and neighbouring countries to try to guard against looting of its sites. "Several major sites bear witness to the great technical and artistic achievements of ancestors of the people and constitute a precious legacy," she said. The sites include the old town of Ghadames, a pre-Saharan oasis city known as the "pearl of the desert", and Sabratha, a Phoenician trading post that served as an outlet for the products of the African hinterland. Analysts said that Libya's archaeological treasures and its relatively undeveloped Mediterranean coastline could prove a lucrative tourist draw if any new government is able to prevent further unrest. In an undeveloped economy the tourism industry was just one sector ripe for investment, along with the agricultural and solar energy industries. Parts of Libya's cultural heritage have been threatened before: in the 1950s, two British soldiers stationed in the country when it was a British protectorate took a selection of ancient relics back to the UK. The items, some of which were up to 2,500 years old, included the bronze prow of a Greek ship found during a diving excursion off the coast of Benghazi. They were returned last year as part of an ongoing Libyan effort to secure the return of its treasures, many of which were removed during the colonial era. The problem persists to the present day. Libya's wealth of important historic sites has long been one of its key appeals to tourists, but museum officials say that government underfunding has meant their relics have lacked adequate security. In 2006, the BBC reported that Tripoli Museum had no security cameras: as a result, at least 90 important pieces had been stolen since 1988 – a figure probably far higher in reality. Archaeological dig sites were also said to be at risk because of underpaid and untrained guards. The government, for its part, blamed failures on the museums. Libya is by no means alone in the problems it faces in securing its heritage in the aftermath of conflict. Egyptian treasures were looted during the widespread unrest before and after President Mubarak was forced from power. A statue of King Tutankhamun and objects from the era of the Pharaoh Akhenaten went missing when looters broke into the Egyptian Museum in central Cairo during mass protests that engulfed the streets around it. 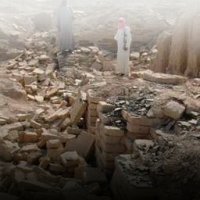 Officials said that thieves repeatedly targeted a storehouse near the pyramids of Dahshour, 20 miles south of the capital. Last year, hundreds of antiquities looted from Iraq during the war there, were returned after they ended up in the United States. And thousands of pieces at the National Museum in Baghdad were stolen or damaged at the end of the US invasion. US marines were accused of failing to do enough to protect the priceless collection of Mesopotamian art housed there.